Setting goals is critical to your success, both personally and professionally. Register below and you will gain stunning insight into your ability to transform your hopes and dreams into crystal-clear goals upon which you can take action. If you find that this area of your performance is a problem for you (score less than 6 out of 10 and you have serious issues,) we will send you our $40 Set Goals Personal Workshop to get you going and growing—FREE! New Members Only. 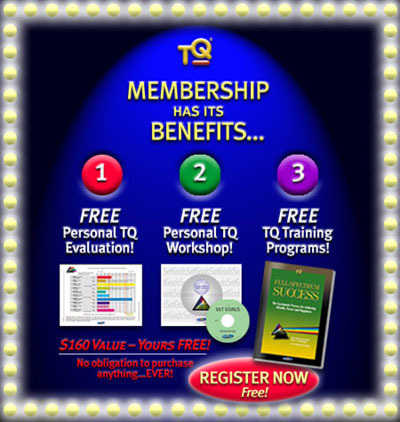 This $40 TQ Training Module is yours Free. Registered Members may download this inspiring new TQ book FREE in our Download Center. With millions of test records, we have found a direct 1:1 correlation between overall SUCCESS and the ability to set crystal-clear GOALS. Put another way, people who struggle with failed hopes, dreams and expectations have a poorly developed ability to turn their dreams and visions into Achievable Goals. How good are you at setting clear goals? Are you at the peak of your potential... or are they holding you back from real success? Take our 10 question TQ Goals Test now. It only takes a couple of minutes and you will see how well YOU stack up against what the most successful people in the world say is absolutely critical to achieving true and lasting success. How? 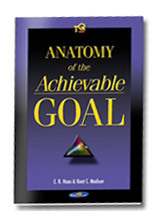 Improve your ability to set Achievable Goals. ThinkTQ, Inc. is the world's leading publisher of virtual training products for personal and professional excellence. Our program is based on scientific processes and accelerated learning systems, tools and technology that make it easy for you to achieve your dreams and goals sooner, rather than later... or maybe never. We have helped millions of people—ministers, doctors, executives, salespeople, small business owners, home office employees, MLM entrepreneurs, consultants, coaches... people just like you—produce results beyond expectations. We will help you too! Using The Time Prism, our revolutionary new management tool, we can separate the blur of your performance into 10 bands of colored light to pinpoint exactly where your performance is strong and vibrant—leading you TOWARDS the success you desire... and precisely where it is weak and faded—HOLDING you back from it. Sign up below and check your Registration Confirmation eMail for exciting details. 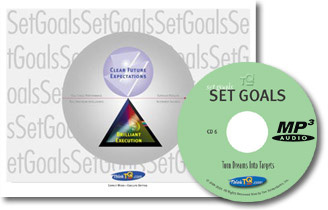 SET GOALS is the fourth Color in the Time Prism Performance Spectrum, because you can't make the leap from here to your vision, all in one jump. You can't just "do" a mission. You need specific, tangible targets to give you immediate direction -- ones which will lead thereafter to even greater destinations. When you set specific GOALS, you target future accomplishments with precision and clarity. Remember, the first step in getting "EVERYTHING" you want is to specify exactly what "EVERYTHING" is. You have the power to be a dreamer and a doer. True success depends on both. Is Your Ability to Set Goals Causing You Problems? Your future is hazy and ill-defined, and you only WISH for things to be different. Having no CLEAR destination, you're often all dressed up with nowhere to go. You may have daily successes, but LACK REAL PROGRESS in any one direction. You never live up to your full potential because there's never anything IMPORTANT enough for you to give 100%. You believe that life could be better, but you're just not sure how. Your future is bright and positive because you know precisely WHAT YOU WANT AND WHY. You have CLEAR TARGETS to focus on and to guide each day's actions and commitments. Your days and weeks build upon each other in a straight line, aiming towards new destinations -- even GREATER than the last. You never want for ANYTHING because you put EVERYTHING into what you want. You believe that life is INCREDIBLE because you are setting and achieving INCREDIBLE GOALS. Now available to Registered Members in the TQ Download Center. Effective goal-setting skills are a huge driver of success, personally and professionally. Take 2 minutes to see how well you stack up against what the experts say are the 10 critical steps to setting Achievable Goals. You will receive an initial evaluation of your test results, and some specific pointers to get you moving in the right direction. If you score less than 7 on your TQ Set Goals Test, you have just found a major hole in your performance. The good news is that this is an EASY skill to learn and improve! On the following page are the 10 key Factors that drive the intensity of this Color. By calibrating your actions against this "Gold Standard", you will quickly see what you are doing RIGHT... what you are doing WRONG... and precisely what you need to do DIFFERENT to improve this area of your performance. If you even think you're having problems in this area, then take our 2 minute quick test, get your 2 page personal evaluation, and find out for sure. Don't just worry about it. Do something about it. Today. In order to save your test results you first need to create a ThinkTQ.com account. Just enter your name, email address, and a password to begin. Get one of our $39.95 personal performance workshops FREE. Each of the 10 workshops is like a graduate-level course in success! Your TQ Test & Review. Find out which areas of your performance are holding you back from achieving the results you want and the success you deserve. Receive a FREE trial subscription to our $120 training package. You will transform your performance every single day with our Daily Lessons in Intentional Excellence. Comprehensive Assessment and Training Tools. Learn more about the most powerful system for achieving personal and professional excellence ever developed. Customers have full access to our entire library of performance analysis and training tools. Registered members receive 30 days free access to our on-line performance assessment and training library.